At Nautilus Inn, we’re ready for another exciting Snowbird season full of pleasant weather and activities for guests to enjoy the season. 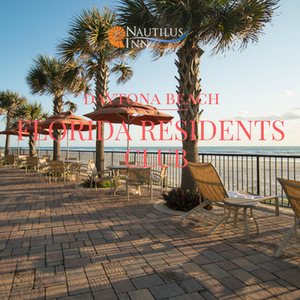 Trade in your snow boots for flip-flops – Nautilus Inn is your ideal location to enjoy a variety of activities indoors and outdoors in our Daytona Beach paradise. From golfing to fishing, biking, shopping, dining, walking on our spacious beach, meeting new people and visiting Daytona’s well-known landmarks – you’ll love spending the winter at our beachfront hotel. There's a lot to do in the Daytona Beach area that won't bust your budget. Whether it's simply a day at the beach or an action attraction, the destination offers value after value. Located in the historic Riverfront Shops, Angell & Phelps Chocolates has been a Daytona Beach tradition since 1925. Take a free, guided, 30-minute tour through the chocolate-making process. Tours begin at 10 and 11 a.m., and 1, 2, 3 and 4 p.m. each Monday through Saturday. Formerly the winter home of multi-millionaire John D. Rockefeller, The Casements now serves as the City of Ormond Beach's cultural center and museum containing art and historical exhibits. Free tours of the Rockefeller period rooms and other exhibits are offered 10 a.m. to 2:30 p.m., Monday through Friday and 10 -11:30 a.m., Saturday. This free seasonal concert series is held May - September each Saturday beginning at 7:15 p.m. The concerts are held at the oceanfront, historic coquina bandshell and feature a variety of musical styles including jazz, rock, swing, country, big band, and Latin music. Be sure to stick around for the free fireworks show at 9:45 p.m. Bring along a beach chair or rent one at the facility. Bethune-Cookman University is one of the richest resources of African-American historical and cultural exhibits in Florida. Bethune's home, located on the university's campus, serves as the headquarters of the Mary McLeod Bethune Foundation. Free, guided tours are available by appointment. This 900-acre park offers over two miles of sandy beaches for recreational use. The area, which is open daily with free admission, features palmetto dunes and sea turtles, as well as some of the best surf fishing in the area. Ormond Bicentennial Park 1800 Ocean Shore Blvd., Ormond Beach This park stretches from the Atlantic Ocean to the Halifax River and covers five ecological systems. It features tennis and racquetball courts, a softball field, a fishing pier, an exercise trail, and picnicking facilities. Admission is free, and the park is open daily from sunrise to sunset. This museum showcases paintings, drawings, video, mixed media, photography and three-dimensional works of art. Adjacent to the museum are lush tropical gardens that offer a beautiful setting complete with gazebo and nature trails, fish ponds and fountains. Open daily, dawn to dusk. Admission is free, but a $2 donation is requested for each visitor, with the exception of seniors (60 and older) and children. The Southeast Museum of Photography is one of only 12 specialized museums of its kind in the United States, and one of fewer than 30 throughout the world. The museum is Florida's official museum of photography. Offering free admission, the museum is open Tuesdays, Thursdays and Fridays, from 11 a.m. to 5 p.m.; Wednesday, 11 a.m. - 7 p.m.; Saturday and Sunday 1 - 5 p.m. June, July and December hours, 12 - 4 p.m. Closed on: Mondays. 950 Old Sugar Mill Road (U.S. 1 to Herbert St.), Port Orange. Set amid 12 acres of lush botanical gardens stands the remains of an English sugar mill. The gardens were once home to the 1940s theme park, Bongoland. Life-size dinosaur statues remain in the tropical setting and are still a favorite with children. The gardens also house a human sundial. The facility is open daily from dawn to dusk, and admission is free. 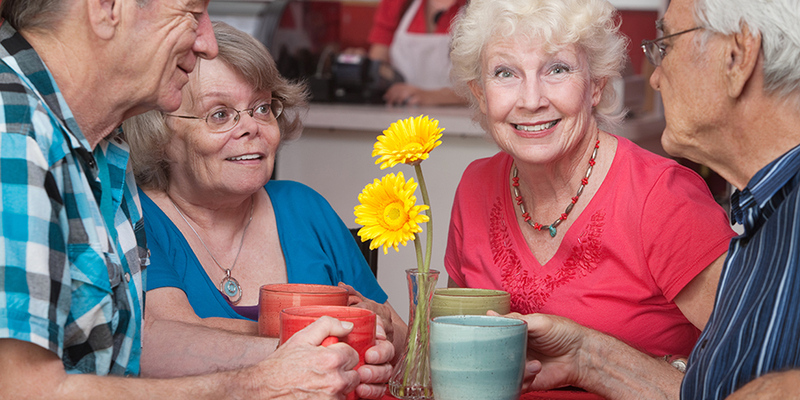 Nautilus Inn's Snowbirds enjoy spending time meeting new friends and sharing time in our spacious lobby and Sand Dollar Room. Each morning a complimentary deluxe breakfast awaits guests - served in a lovely setting with an ocean view. Each evening, enjoy Nautilus Inn’s complimentary cocktail hour in the Sand Dollar Room with your winter friends. 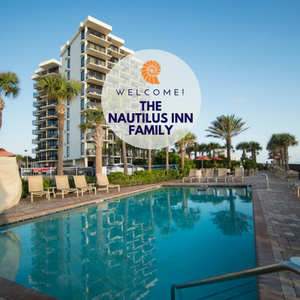 Book your stay this winter with Nautilus Inn – you’ll love spending time in our newly renovated contemporary non-smoking guest rooms, private oceanfront balconies and plenty of well-appointed hotel rooms with contemporary in-room amenities to assure a pleasurable vacation stay. From our on-site social activities to our accommodations – we promise you will experience the finest qualities of a Florida beach vacation while enjoying your stay. If you haven’t made plans yet to spend winter at Nautilus Inn – make your plans to join us today! We’re thrilled to say “Welcome Back”! Call (800) 245-0560 or (386) 254-8600 to receive our Florida Resident or Past Guest special offers or view our Daytona Beach Fall Specials.